In recent weeks our country has witnessed several tragedies involving firearms. It took no time for some people to start blaming the gun for the tragic event, not the hand that held the gun. While the folks on the left side of the 2nd Amendment call for more restrictions on legal gun ownership, I am calling you and all other law abiding gun owners to arms. For some reason, some people think that they can better protect their fellow citizens by disarming them. Did outlawing cocaine, heroin and other dangerous drugs work? Has outlawing driving while intoxicated kept drunks off of the road? There is a common link between the places where these tragedies have happened. All weapons were restricted from these places. We Americans have given up so many of our rights over the years in the name of “Safety” that have left the most innocent vulnerable. What if one teacher at Sandy Hook Elementary was a legal concealed handgun carrier and would have been able to carry at school? How many lives could have been saved? The evening following the shooting at Sandy Hook, my kids and I were watching the news about it and my youngest son (who is of elementary school age) asked “why don’t they let teachers carry guns, then the teacher could have shot the bad guy.” Even my youngest can see that more guns in the right hands is better than taking guns away from the law abiding citizen. Disarming citizens does not make more security, it makes for more victims. If taking a citizen’s guns away make them safe, then why is it that on the same day that we had the Sandy Hook shooting, in China a man stabbed 22 children and one adult before being apprehended at a primary school. On opposite sides of the globe on the same day children were attacked as they went to school to learn. Of all of the school shootings we have had, all have one thing in common. Cowards attacked our children while they and their teachers were prohibited from having the tools to defend themselves. 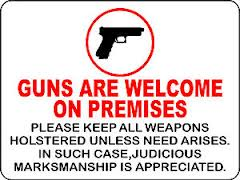 Gun free zones do not create security. They create potential pools of defenseless victims. To give our children true security we must first give them the resources for them to truly be defended. The school boards will begin the argument by saying that there is not enough money to put armed security at every school. Most of us can understand the strain that school budgets. What about having a handful of teachers and/or other school personnel in each school be specially trained and armed for such a situation might it arise? This is only one idea on the subject of protecting our kids as they go to school. It might not be the best for every school, but we must start somewhere. In the coming days and weeks keep the friends and families of these unfortunate victims in your prayers. They will need them. While you pray for the families and survivors also pray for our nation and our leaders, may they not use this tragedy to hinder others from protecting themselves. Pingback: Will you stand up and fight or will you go silently into the dark night?